The recipe came from my preschool, actually. I don’t remember what the context was anymore, but they must have recruited parents to make these for some special event, so my mom did – again and again as all three of us kids went through the school. My the time my sister got to Kindergarten, they were a family staple. These take a bit of time to put together. Kneading in the color takes a bit of effort, and getting the dough into the perfect size is an artform – but once you have the log assembled, it becomes easy-peasy. The chilled dough turns into a fun slice-and-bake log – and the dough cooks up just perfectly every time. This recipe showcases Dixie Crystals sugar – one of our fabulous #SpringSweetsWeek sponsors. While nearly every recipe I’m posting this week involves sugar, these cookies showcase it beautifully. There aren’t any fussy flavors here – it’s a no-fuss sugar cookie. Dipping it in sugar again before baking, though, adds a beautiful texture to these cookies! In a stand mixer, beat together the shortening, 1 1/2 cups sugar, eggs, and vanilla until very fluffy. Add in the flour, baking powder, and salt and mix until combined. Add in milk and mix until a dough ball forms. Divide the dough into three equal balls. Color one pink and color the second yellow. Split the third ball in half and color half green and half blue. Roll the blue into a thick log about 8″ long. Roll the green into an 8″ rectangle and drape over the blue. Repeat with the yellow and pink. Wrap the dough in plastic wrap and chill for at least two hours. When ready to bake, preheat the oven to 400 degrees. Pour remaining sugar into a shallow bowl. 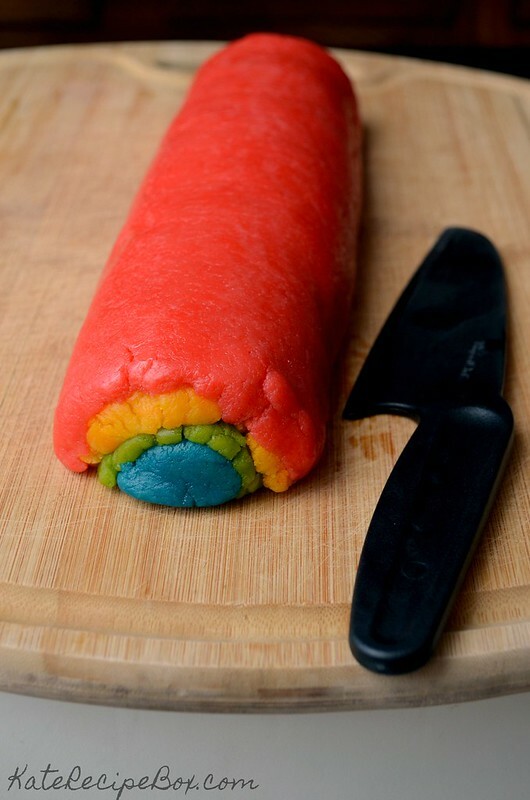 Slice the dough into 1/4″ pieces. Dip one side in sugar and place on a baking sheet, sugar-side up. 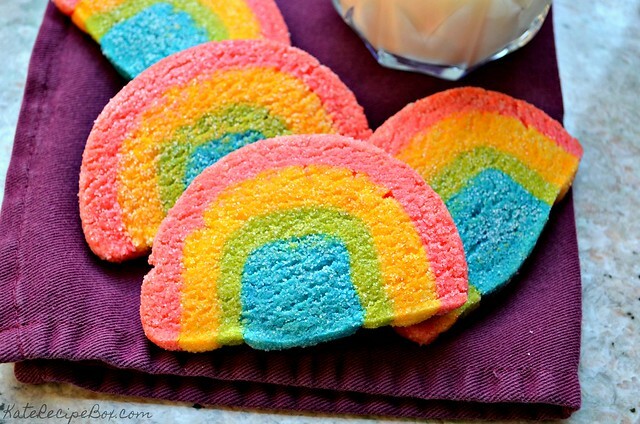 I don’t know what to say but I am in love with this rainbow cookies. 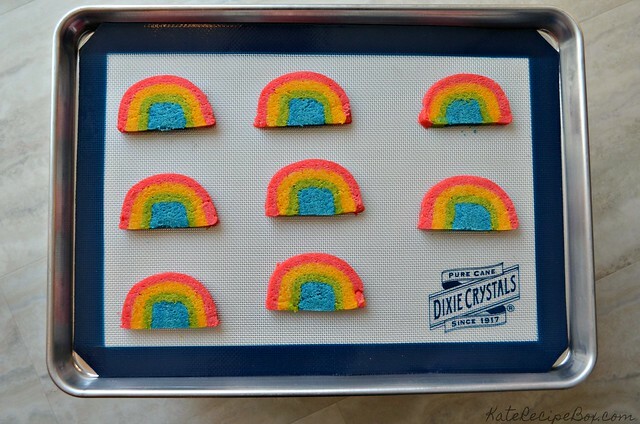 These rainbow cookies would make me happy too! Oh my goodness, such happy and pretty cookies. They look fun to make too. I know I would like slicing up the rainbow. How fun, I love refrigerator cookies. I need to give these a try! 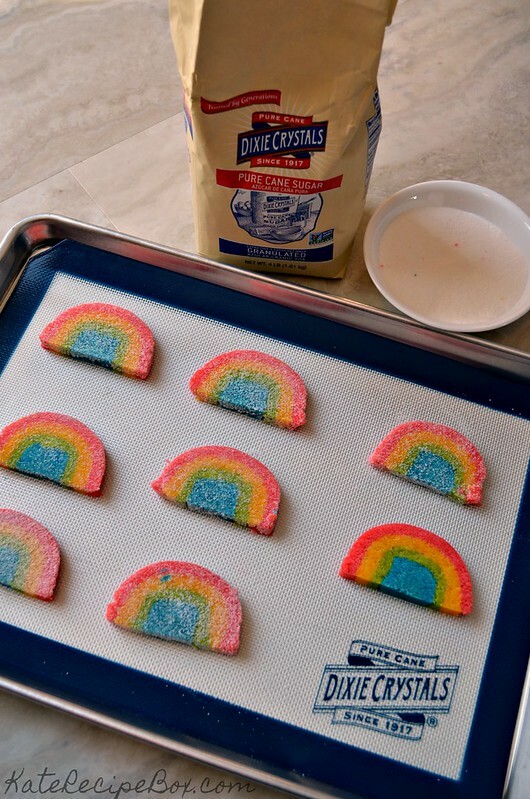 I love refrigerator cookies, I need to give these a try. These cookies are so cute and fun! When my daughter gets a little older, she’ll be wanting to make these all the time! I love traditions like that, and these are an especially cute tradition! I am going to have to invent an excuse to make some soon! These are so fun! They definitely make me think of Springtime. Delicious! I think we’ll have to make these ourselves too! I love recipes like this, that have been handed down from parents and grandparents. It always makes them taste extra special, eating something we grew up on. What fun cookies and so many possibilities, pastels for Easter, green, red and white for Christmas, orange, purple and black for Halloween. 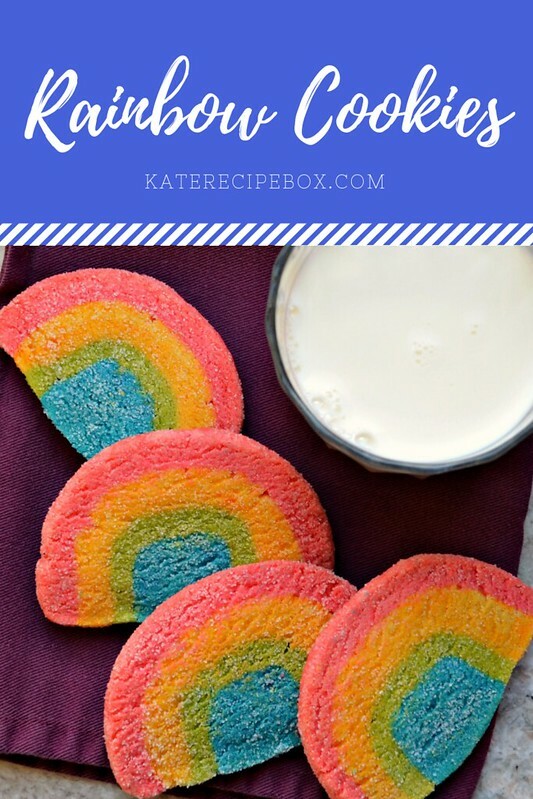 Rainbow cookies are so fun! These are a great idea and I bet kids love them. what a fun cookie! my grandkids would love these! I’ve tried making layered cookies before but mine never looked this perfect. Very nice! Wow. These look super cute! Definitely a new technique I have to try.